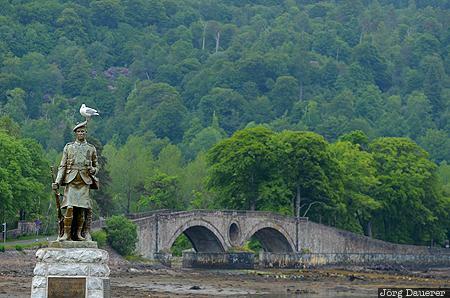 A sea gull sitting on the head of the bronze statue of a Highland Infantryman at the Inveraray Memorial Monument with Inveraray Bridge and the green hills of Scotland in the background. Inveraray is in Scotland, United Kingdom. This photo was taken in the afternoon of a cloudy day in June of 2013. This photo was taken with a digital camera.